Vacation rental house. Sleeps 30, 10 bedrooms, 9 bathrooms. No pets allowed. View from the main deck, the Resort dock is the largest residential boat dock in the US and holds up to a 150ft Yacht. View of the pool and attached jacuzzi tub at the Resort with views of the water and docks. View of the main deck seating facing the waterway and a boat docking gate. One of several covered docking areas, this one is at the northern end next to the large sitting deck. The north boarding dock facing south to the canals of Boca Ciega Bay at the resort. The communal pool is located on the deck of the Bay house. 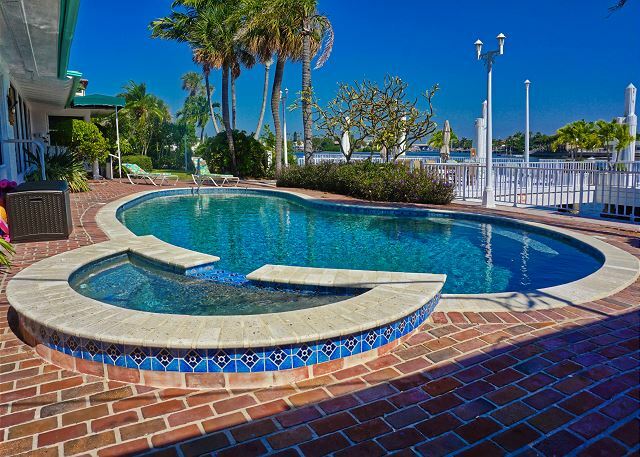 As you walk out of the Bay house the pool deck, the large main deck is just beyond near the waterway. View looking towards the Bay house entry to the left on the pool deck. Your view as you enter the gate located outside the Bay House on the north end of the Resort. As you step out of the Bay House onto the paved deck this is your view on the left. This walkway takes you back to the entry gate of the property and the hidden side door into the north side hallway. Large tables with ample seating and umbrellas, this is the main deck with boat docking on all sides. 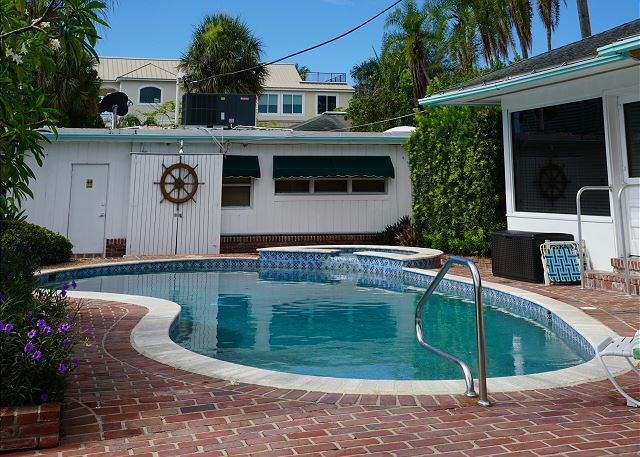 The hot tub offers seating and is located between the Captains House and the Boat house with views of waterway. View of the hot tub from the Boat House entry, the Captains house is in the background. View of the Boat house from the outdoor covered grilling deck. View of the entry gate that is located between the Boat and Bay house which is accessible from the Boat house driveway. The boat house is on the left in this photo with the pool and Bay house to the right from inside the deck. Outdoor view looking towards the Captain's house, there are many padded loungers available along with umbrella tables for guests. 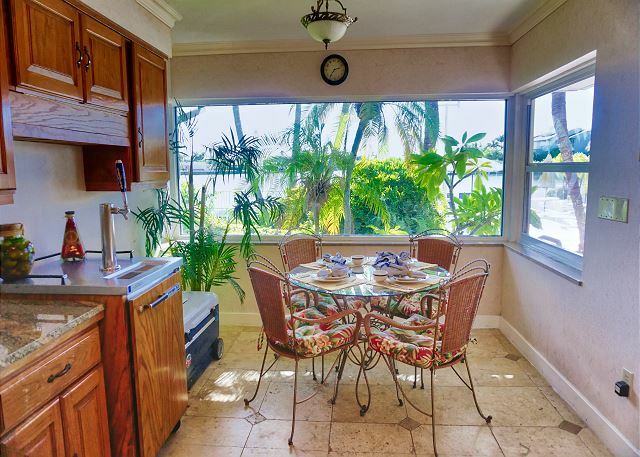 This private deck with table is located just outside your back door, the perfect place to sit and watch the Sunrise, Boaters, Dolphins and views. Ask us about bringing your boat along for your vacation! View of the covered dock area from the South side fo the property, we also offer dock slip rental if you are looking for a place close by to keep your watercraft. View of the covered deck grilling kitchen and sitting area, an amazing view anytime of the day! The outdoor kitchen is complete with two grill stations, stove top gas burners and a flat screen TV overhead. The two main grills of the outdoor kitchen on the dock, surrounded by views of the intracoastal waterway. This area location is centered on the property with the Boat House being the closest residence. 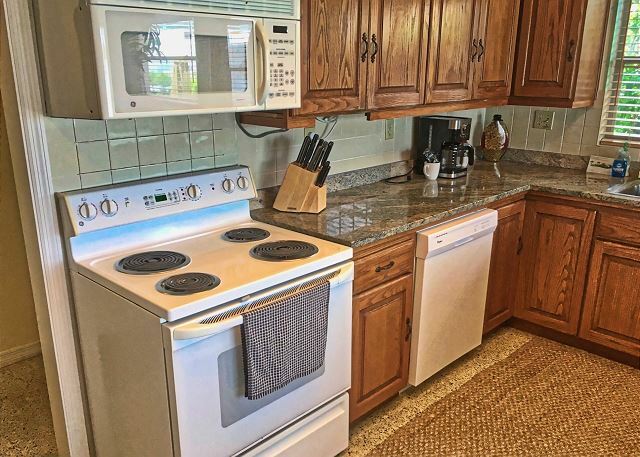 The covered area of the boat dock offers a full grilling kitchen, we keep plenty of extra gas available along with a large covered trash dispenser. 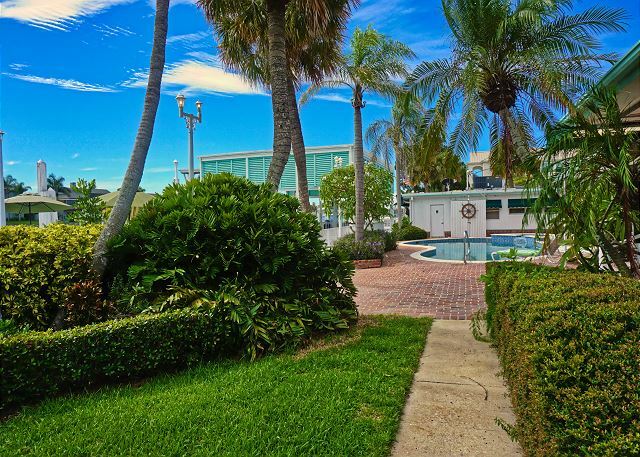 The Resort on Pass-A-Grille, 3 homes on a city block with the largest residential boat dock in the US. Pass-A-Grille Way, as you reach the Resort entry on your left at 27th avenue. This view is of the newly constructed, Palm Tree lined with majestic street lamps passage into the community of Historic Pass-A-Grille. View of one of the boats visiting here at the resort, this spot is on the southern end of the docks. Entry to the outer dock, this access is perfect for the arrival and departure from larger vessels at the Resort. Heading south from your dock is the Vina Del Mar Bridge, as you go beneath and come out to your right is the Marina. The Wharf & Critters restaurants with dock parking are also right there. Local Sunset Cruise Ship docking at the resort to pick up guests for the evening. This is the largest residential boat dock in the US, holds up to a 150ft Yacht. 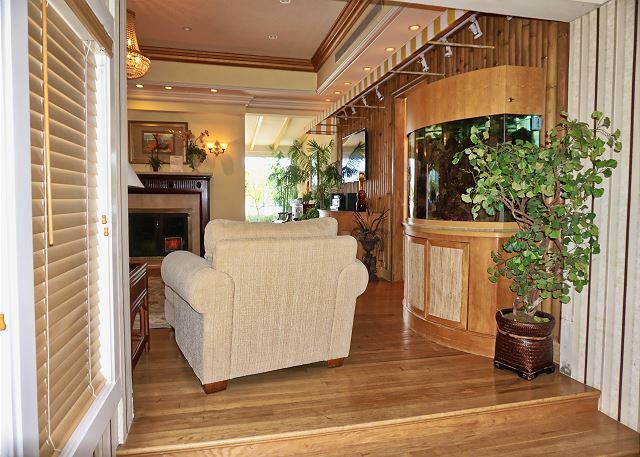 This photo shows part of the freshwater fish tank that lights up each evening along with a view from the front entry foyer into the living room. 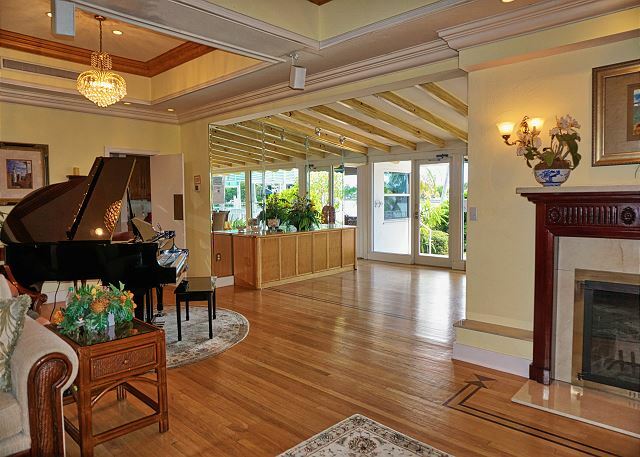 The Bay House living room view as you are standing at the piano. 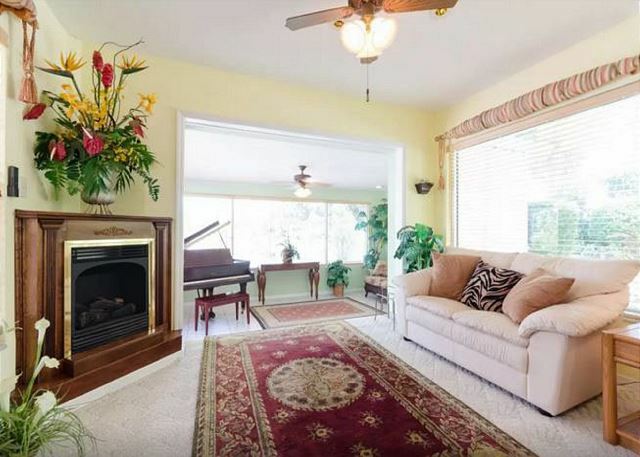 Standing at the center of the living room at the bay house looking at the Piano, buffet table and onto the back windows and doorway to the deck on the right. View while sitting on the living room couch in the Bay House, the dining table and water views are on the opposite side of the fireplace. The Bay House living room view when standing at the hall entry to several bedrooms. Viewing from the couch in the living room to the TV and an entry to the large dining area with floor to ceiling windows that offer a Bay Water View. 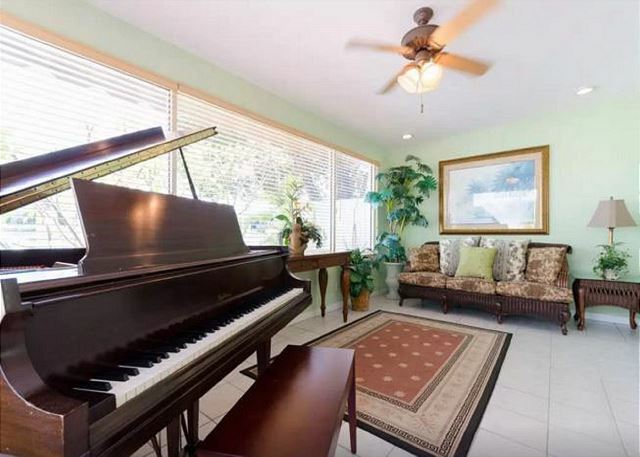 The electric Piano can be used manually or setup to play pre arranged music. This sits at the end of the living room towards the north end of the Bay House. 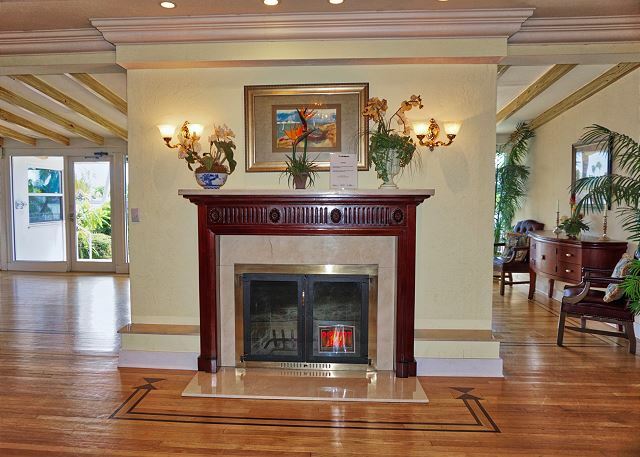 The view as you enter into the front door foyer at the Bay House. 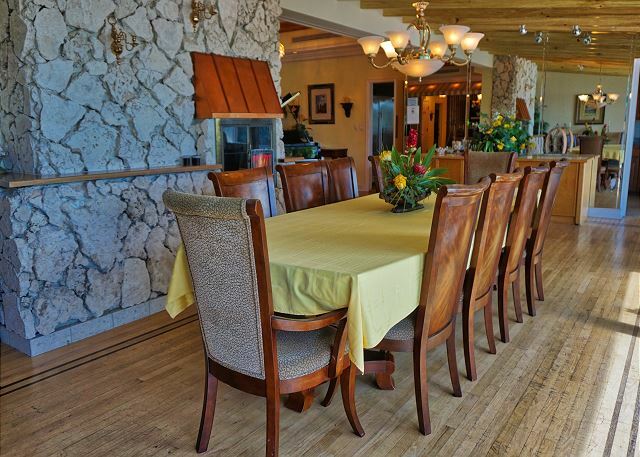 View of the spacious dining table that sits next to the pool and bay view windows in the Bay House. Your view through the floor to ceiling windows in the Bay House dining room. 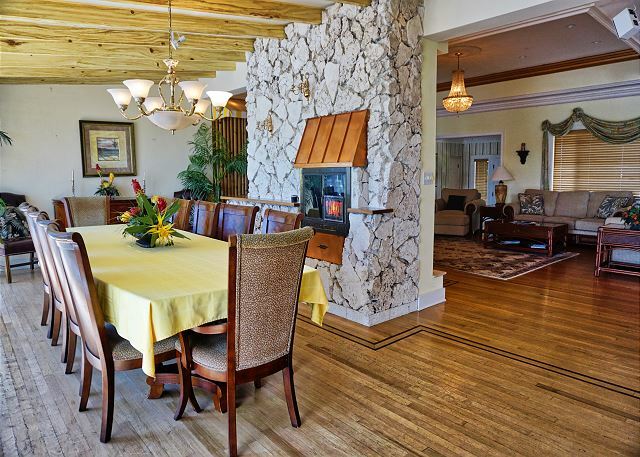 he view as you enter the Bay House from the back, Dining with open space to living room. Seating on either side of a buffet table at the end of the dining table in the Bay House. View of the Bay House kitchen looking towards the back, there is a four chair dinette with views of the pool, foliage and water. The Bay House kitchen view from the dinette shows the large stainless steel refrigerator, granite counter top for working next to the ovens. 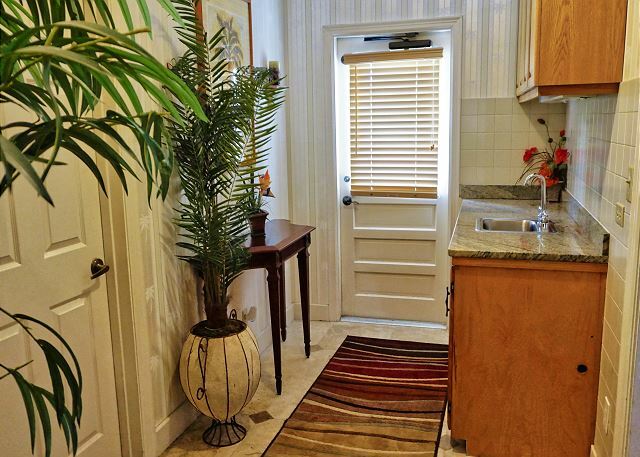 the doorway to the left takes you in and out to the dining room and exterior exit door to the pool deck. 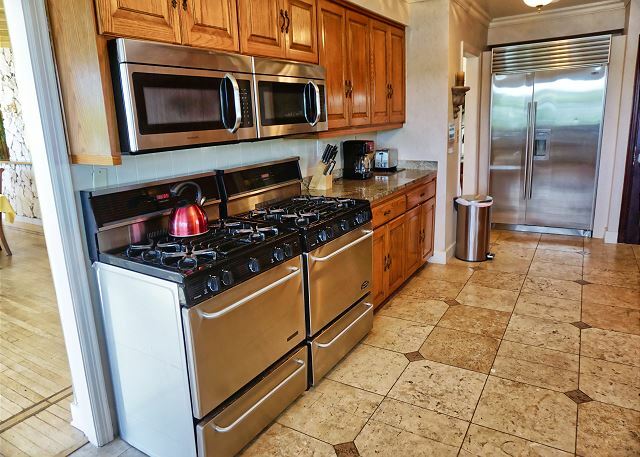 Double 6 gas burner stove tops, ovens and microwaves at the west end of the Bay House kitchen. The kitchen view at the Bay house from the dinette. 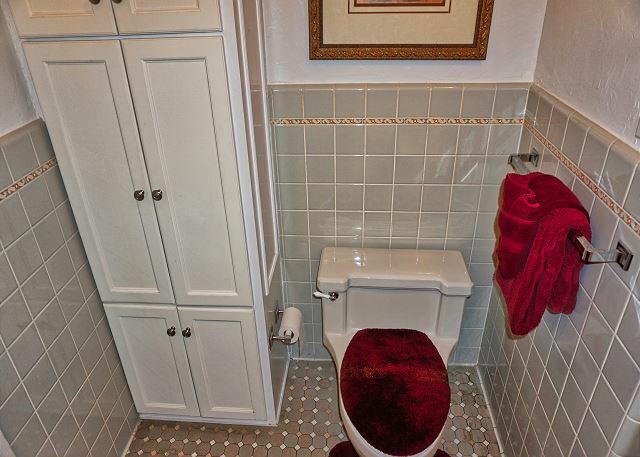 A working station with small sink, cabinets, and a private door leading to the back decks. This is in the hall outside the kitchen and double bedroom at the Bay House. 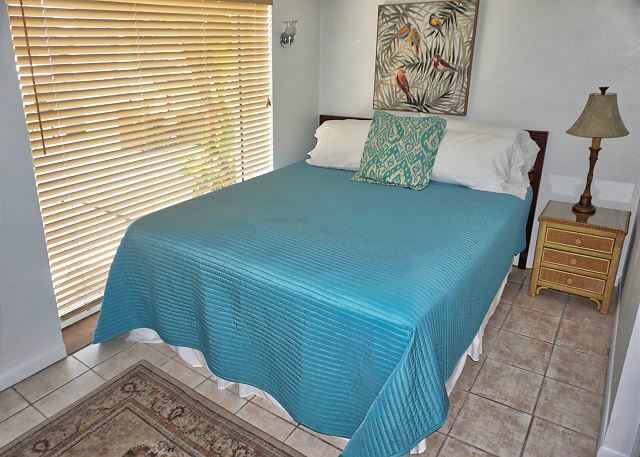 At the Bay House just outside the kitchen and double bedroom is the hall and entry that leads to the laundry, sleeping room with exercise equipment , the laundry room with extra large cooling refrigerators along with the Single Bedroom with ensuite bath. 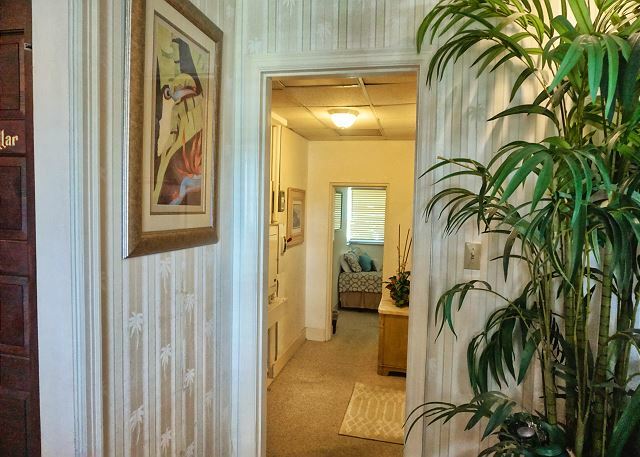 As you enter the Queen bedroom located on the west side off of the living room at the Bay House. Night tables offer ambient lighting in the west side queen bedroom. The intricate wood with wicker framed queen bed, private closet, an ensuite bath and TV offer plenty of space and privacy. he ensuite bath in the west queen bedroom, linens are provided along with toiletries. The ensuite bath in the west queen bedroom, linens are provided along with toiletries. 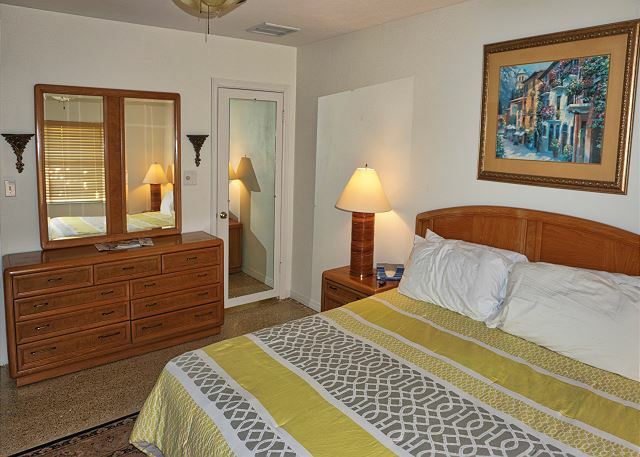 Located in the back exercise room with flat screen TV are two double beds for additional guest sleeping. 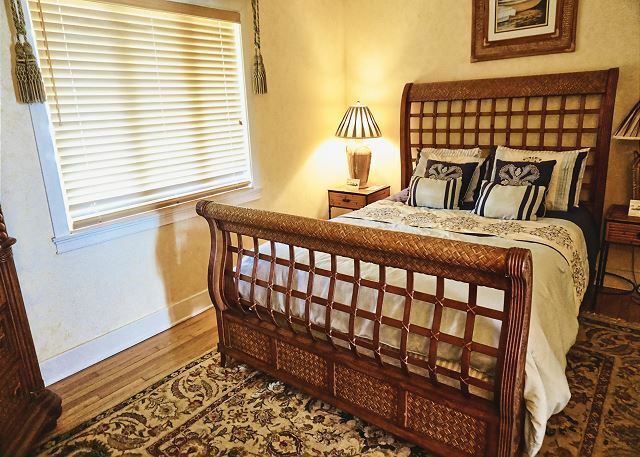 This sleeping space is on the north end of the Bay House hallway. It offers exercise equipment and two double beds along with a flat screen TV and extra seating. 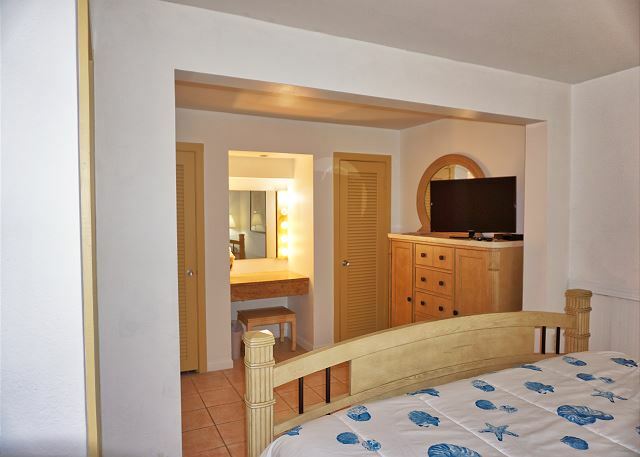 The Bay House double bedroom has a TV, dresser for storage and an ensuite bath. This is located on the north end off of a private hall near the kitchen. The view entering the Bay House north Double Bedroom ensuite bath. Private ensuite bath in the double bedroom at the Bay House. This is located on the north end off of a private hall near the kitchen. 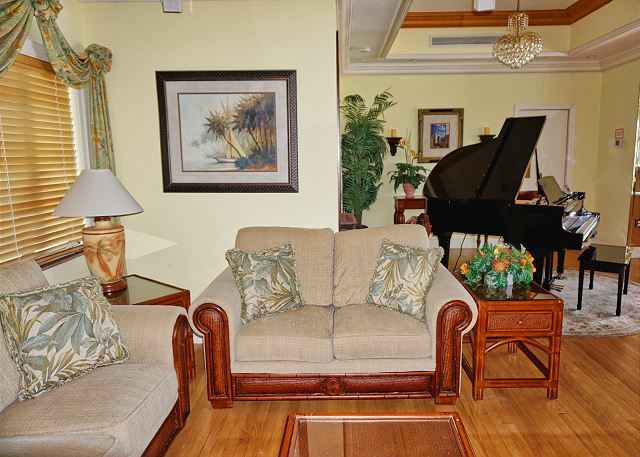 The Bay house Master is decorated with intricate wood furniture and a wooden decorative ceiling. he ceiling in the Bay house master bedroom with large wicker fan. 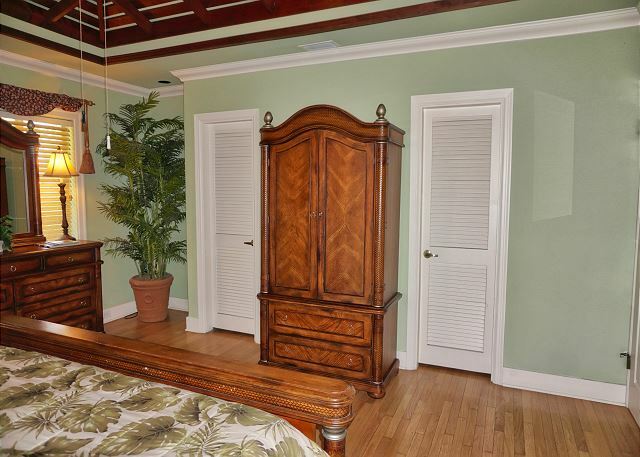 View of the TV Armoire and walk in closet doors on each side in Bay house master bedroom. 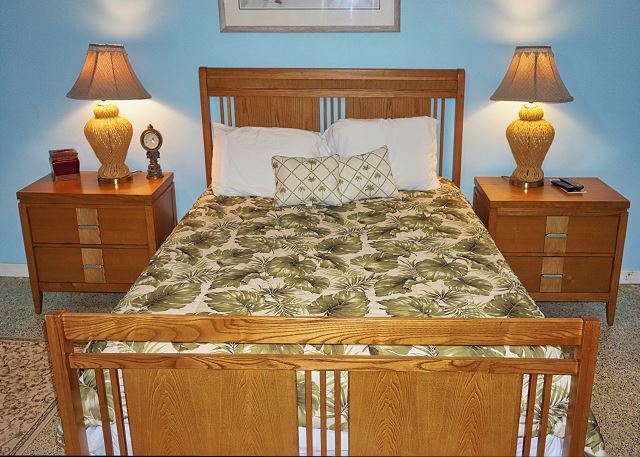 The Master Bedroom at the Bay house offers night tables, lamps with ambient lighting and storage. View of the TV Armoire and walk in closet doors on each side in Bay house master bedroom, the entry from the hall doorway is on the right. 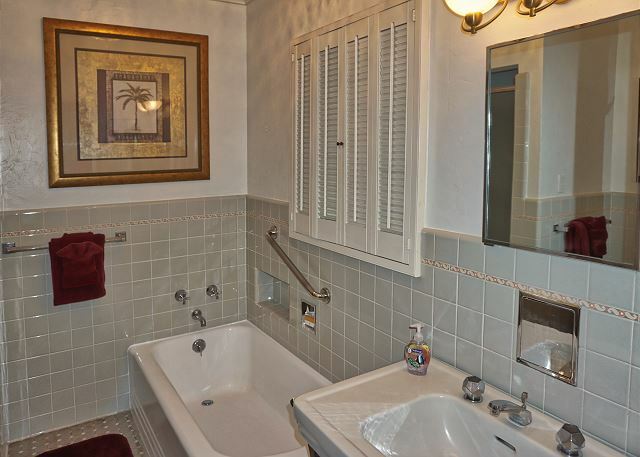 The Master bath in the Bay house, storage for linens which are included during your stay. Your view of the outdoor pool and decks from the poolside Queen Bedroom at the Bay House. Your picture perfect window view as the sun is rising on the water, Queen poolside bedroom at the Bay House. 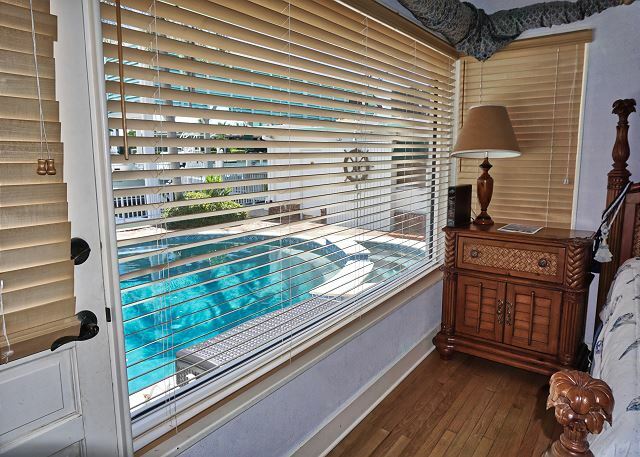 Next to the window is your private entry door to and from the pool and docks. 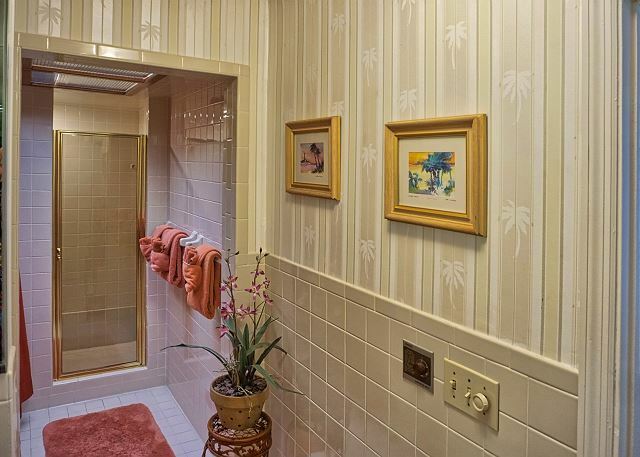 This is in the poolside Queen Bedroom at the Bay House. The Bays poolside queen bedroom ensuite bath. Linens are provided along with toiletries. Private twin bedroom, this also has an ensuite bath with shower. 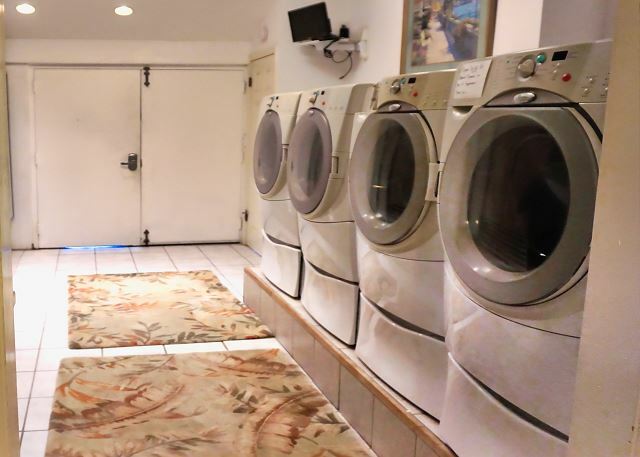 The laundry at the Bay house offers two washers and 2 dryers along with a TV mounted in the corner for entertainment. 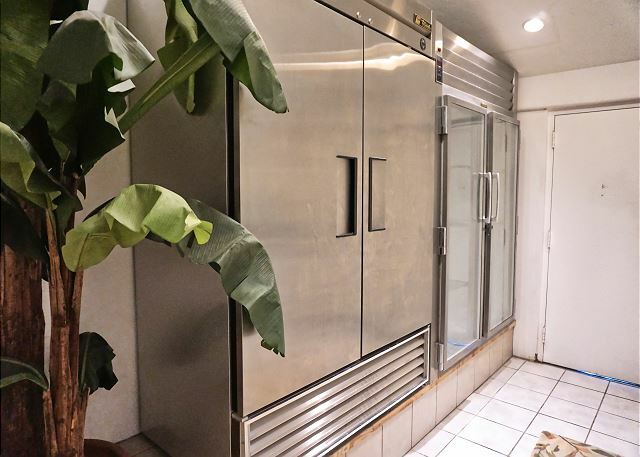 The Bay house offers two large professional size coolers for storing large amounts of food and flowers when there is an event being held, these are located in the laundry area. Your view as you enter the Bay house from the private driveway doorway. 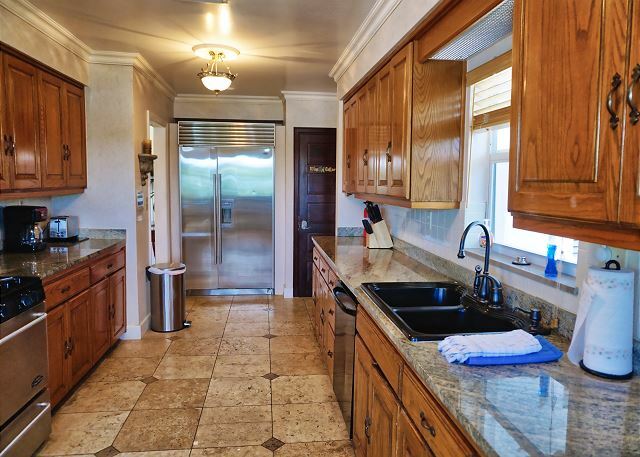 Standing at the double sink looking towards the entry on right and appliances. 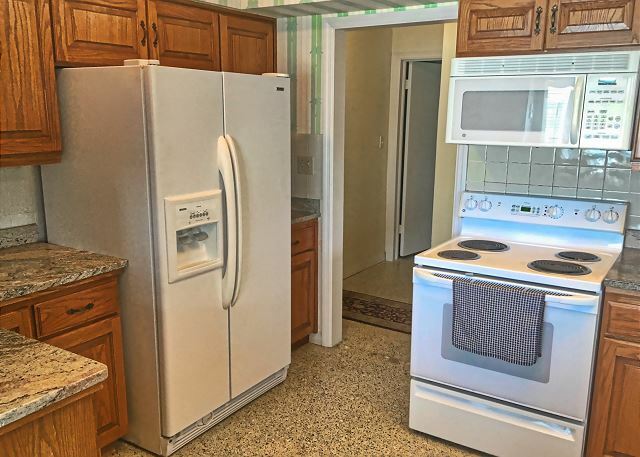 The Captains house kitchen has new appliances in white. 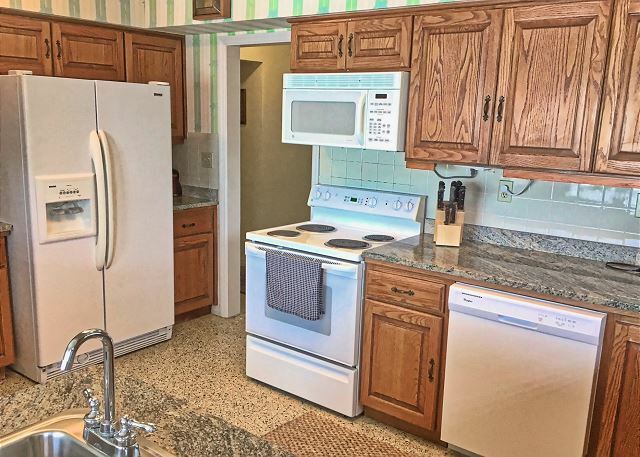 Surrounded by plenty of counter space on all sides. 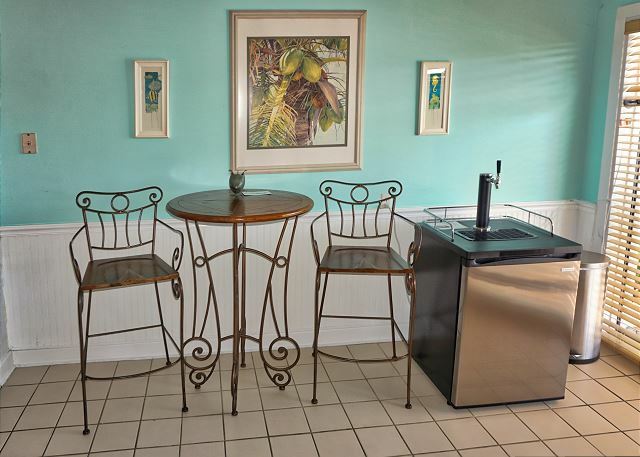 We provide a coffee maker, toaster, dish soap and paper towels for use upon arrival. 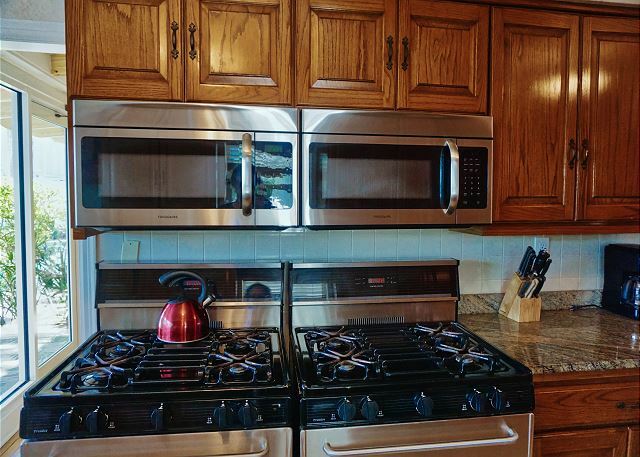 Full size over and stove top, dishwasher and microwave with storage cabinets line the far wall. The opposite side offers a window view of the dock, water and seating area. The dining area sits right next to the kitchen and offers space for a large group meal. View of the Master bedroom from the entry to the ensuite bath. The Master bedroom at the Captains house, view from the bedside window of the entry doorway and large dresser with mirror provided for storing your gear. The Master bedroom at the Captains house with ambient lighting, night tables and all the comforts of home. The Master bedroom view from the foot of the bed shows the flat screen TV cabinet and a table for extra essentials. 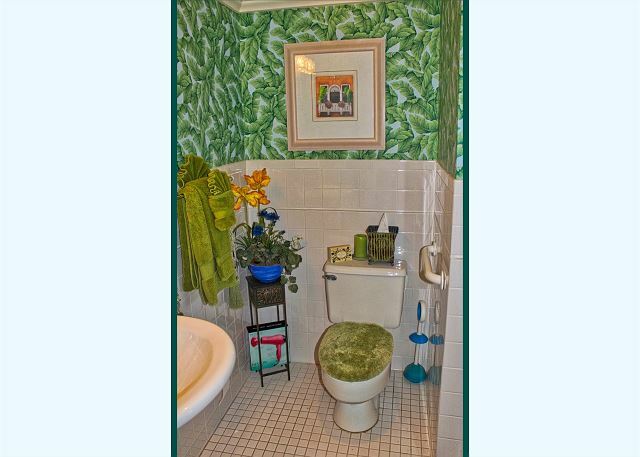 The ensuite bath entry is on the far right. The Master bedroom ensuite bath offers a large standup shower, alcove toilet, a jetted tub and large vanity sink with full wall mirror. 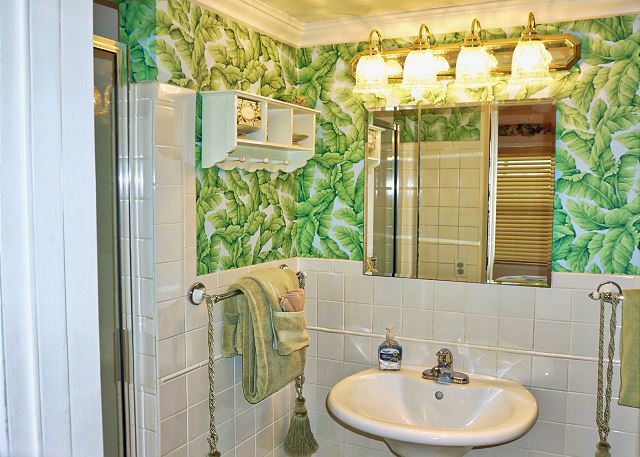 Toiletries are provided upon your arrival in both bathrooms at the Captains house. The jetted tub in the Master bedroom ensuite bath. 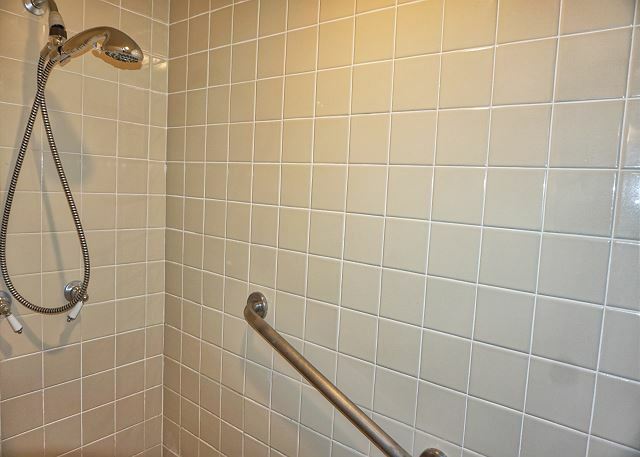 The Master shower offers an extra support bar for safety and is large enough for two people. Ambient lighting and night tables along with a comfy queen bed and fresh new linens. The Captains guest bedroom, this view shows the private entry door to the main bath, large dresser and flat screen TV for entertainment. 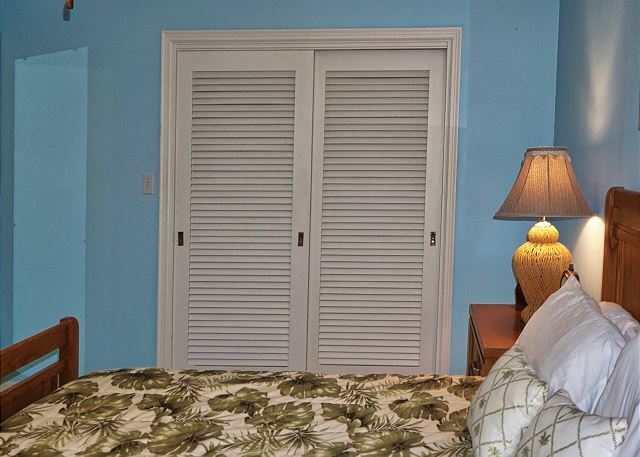 The Captains house guest bedroom closets offer plenty of space for storing your luggage and hanging clothes. Located in the hall closet is a stacking washer and dryer, we also provide soap to use on laundry day. As you enter the boat house from the dock you will be in the kitchen, the bar table and keg cooler are inside to the right. 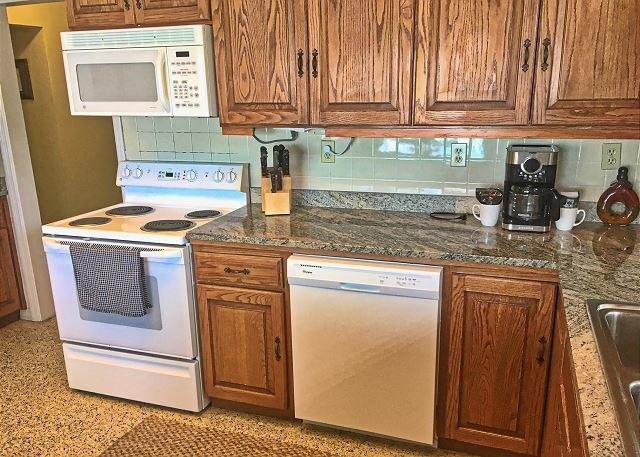 The kitchen offers a dishwasher, refrigerator, full size stove, microwave and other cooking essentials needed for your stay. 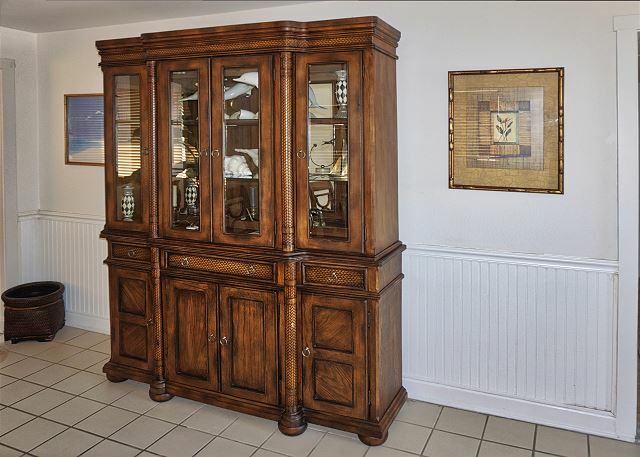 In the dining area of the Boat house sits a large China Hutch with storage cabinets below filled with linens. The view from the foyer of the living room with two couches and two chairs for visiting. Gorgeous heavy wood bed with ambient lighting on the side tables in the master bedroom. The dressing and makeup vanity is at the far end of the master bedroom, there are closets on each side of the vanity for storage. 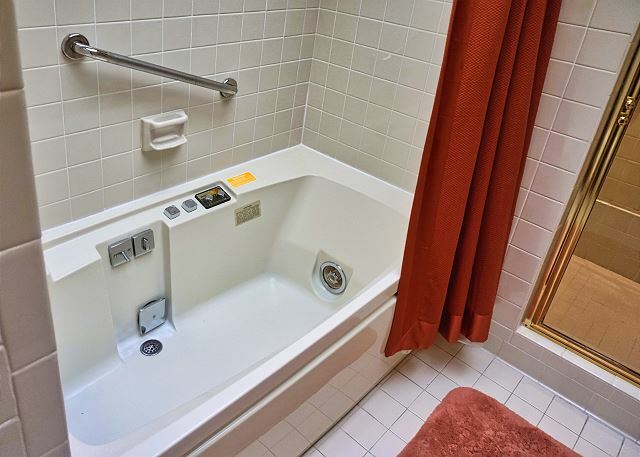 A large soaking tub and shower along with linens and toiletries are provided. 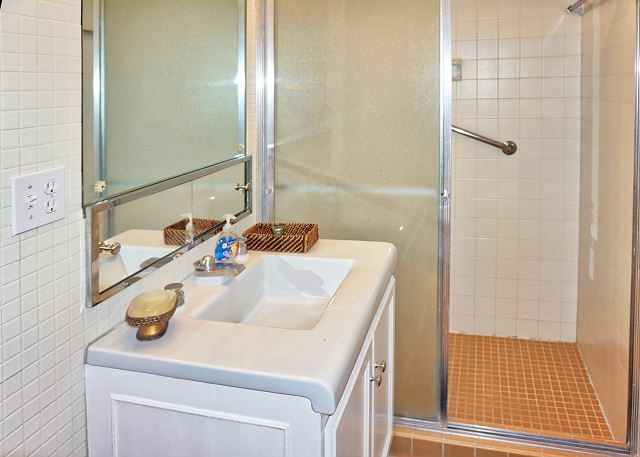 The Main Bath in the Boat house is complete with tub, shower and a large vanity sink with plenty of storage area. The Guest bedroom in the Boat house, this sits on the east side facing the dock and waterway. 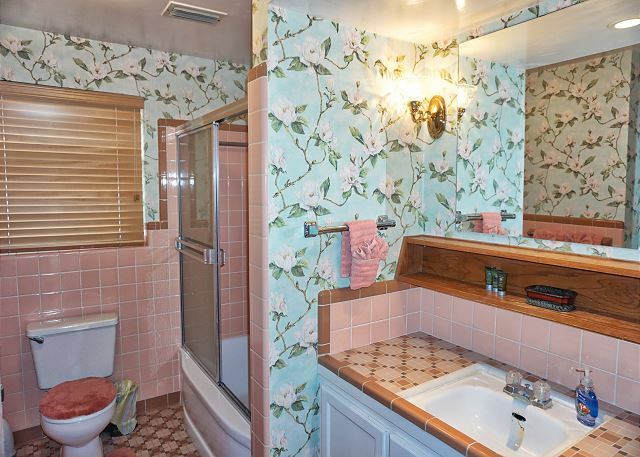 The boat house guest bedroom ensuite bath offers a large standup tiled shower. The Pass-A-Grille Boutique Resort sleeps 30, 10 bedrooms, 9 baths, You will enjoy the full kitchens, an indoor kegerator, in the main house, free standing ice maker in the main Bay house, dining areas, living areas, electric fireplace, pool, workout room, flat screen tvs, 2 large capacity washers/dryers in the main house, washer/dryer in the South Captain's House, and professional size refrigerators for catering or to keep that big catch fresh.in the Main house. The Bay House at The Birds of Paradise Boutique Resort, which sleeps 13 in 6 bedroom, 5 bath house with 1 king, 3 queen bed, 2 full, 1 twin bed. 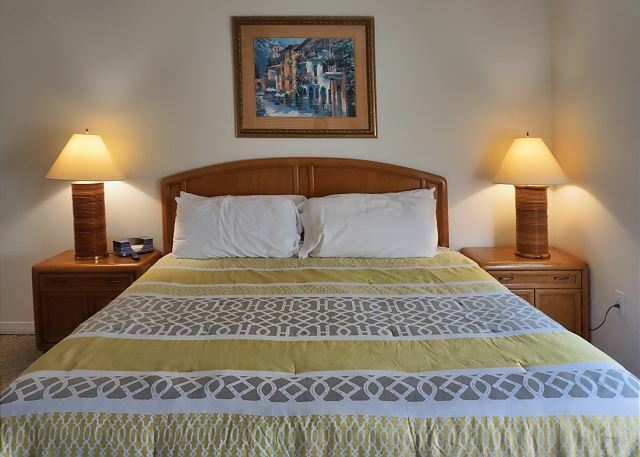 The Boat House/Middle House at The Pass-A-Grille Boutique Resort, sleeps 7 in 2 bedrooms, 2 baths 1 king bed, 1 full beds, 1 twin air mattress and a sleeper sofa. 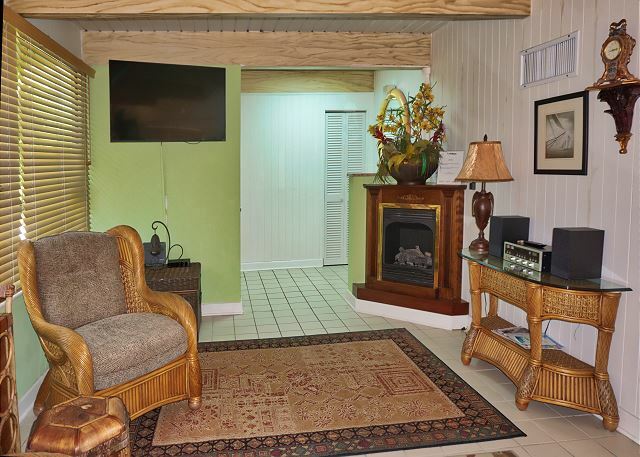 There is a full kitchen, the living room, dining area, electric fireplace, shared pool, flat screen TVs. Largest Boat Dockage in a residential area in the USA with excellent fishing! Only 3 houses from the beach, sand, surf and Gulf of Mexico! 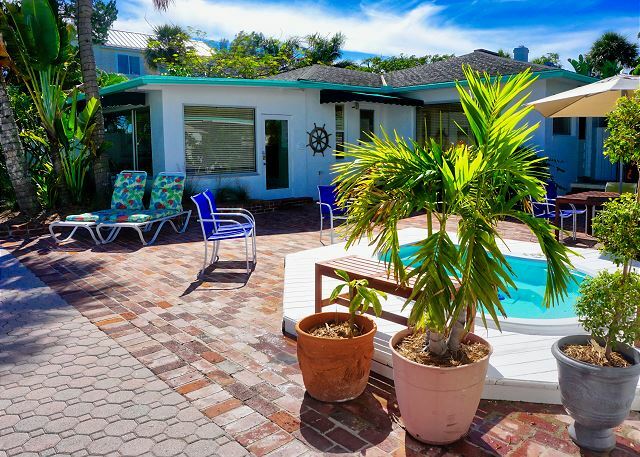 This property is a licensed waterfront Boutique Resort located on the barrier island of Pass-A-Grille Beach on the Gulf Coast of Florida. This quaint and historic little village has been a favored destination of visitors from every walk of life and from every corner of the globe for almost 200 years. 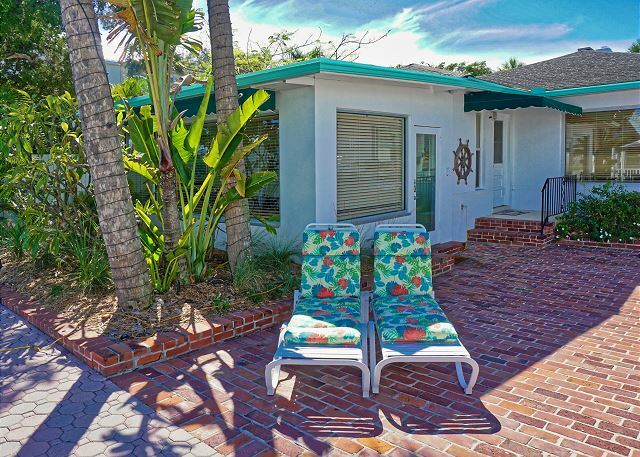 Pass-A-Grille enjoys a National Historic Designation and Pass-A-Grille Boutique Resort is located in the center of this oasis of history and beauty. The Estate spans the length of a city block and directly fronts the deep and protected waters of “Little McPherson Bayou,” with immediate boating access to the Gulf of Mexico. 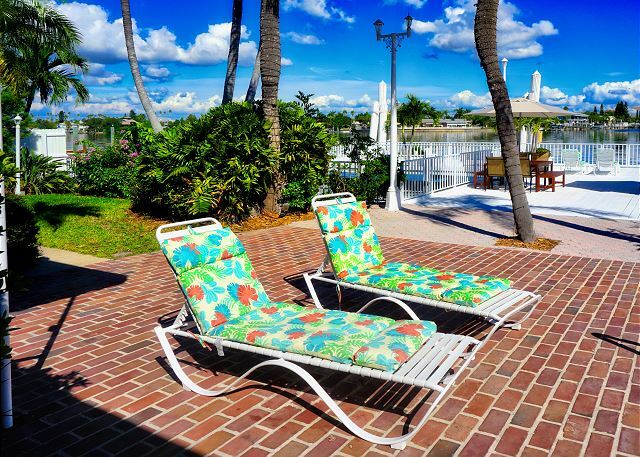 The majestic Pass-A-Grille Boutique Resort is graced by a premier waterfront, free form pool and richly landscaped grounds and overlooks its own private marina. This pristine 220-foot wharf can accommodate vessels up to 140 feet and nine more slips can easily moor vessels from 40 to 70 feet. This incomparable moorage comprises the largest private deep water dockage and covered boat house in the Southeast. Additional marine equipment includes an electronic 15,000 lb. boat lift and an adjacent lift for twin personal water-craft. This enviable marina has six individually illuminated marine power stations with electricity, water and cable. Beautifully landscaped and illuminated planters and trees grace this expansive and incomparable moorage. The Estate legally sets on one parcel of land and consists of three beautifully pointed waterfront homes offering 7,000 square feet of living space. Each home expresses its own individual character, evident with spacious living rooms, gracious dining rooms, full service kitchens, and plentiful bedrooms and baths. The interiors are furnished in Caribbean style with a rich combination of vaulted and recessed ceilings trimmed with crown moldings. 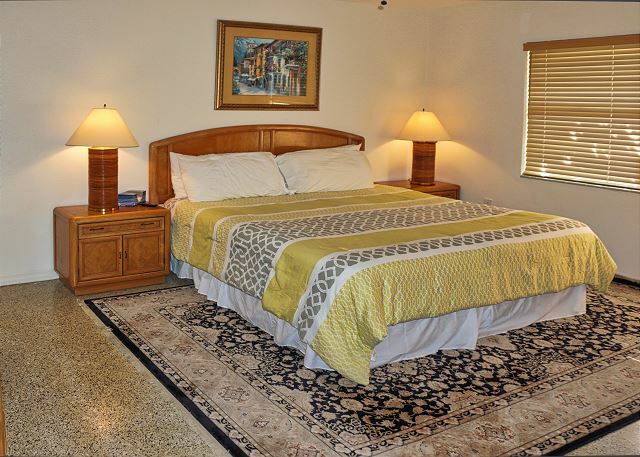 Elegant hardwood floors, tile and vintage terrazzo with beautiful area rugs grace the pathways through the rooms of this true period example of Florida architecture. The homes are tropical, yet elegant and are richly enhanced by the ambiance of this little historic village on the Gulf of Mexico. It is truly one of the most valuable and desirable properties in the United States. This Resort is the perfect place to celebrate Birthdays, Anniversaries, and Weddings. We had an amazing Thanksgiving vacation at this property! We were able to easily accommodate six families with 28 people inside the three beautiful houses. The dock area was beautiful and served as the perfect gathering place for everyone. The staff and maintenance people will both wonderful to deal with. Thank you for a great family memory! We rented the entire property ( 3 houses) and stayed here with all of our close family from 10/18 - 10/21. We had our ceremony on the dock and it was perfect. Vivian was a huge help and available when there was a minor outdoor lighting issue. She showed up quickly with a technician and resolved the issue immediately. The houses were clean and we had all we needed. Great service and gorgeous property. - It was a great layout for a large group. We all had our own space and weren't on top of each other like other house rentals. - The kegerator outside was really dirty and ultimately unusable. Additionally, half way through our stay we were informed that CO2 tanks were our responsibility and their recommendation on where to buy new tanks was closed on the weekend. - Do not email the company, it will take them forever to get back to you, if ever. We got the quickest response using the VRBO app. Eventually we received pre-arrival information but well after we already needed that information for our group and had to request this information. - Early checkin and checkout is only available if you are willing to pay an hourly rate based on the rate of the house, which is ridiculous. Luckily due to construction they allowed us to drop off food early. 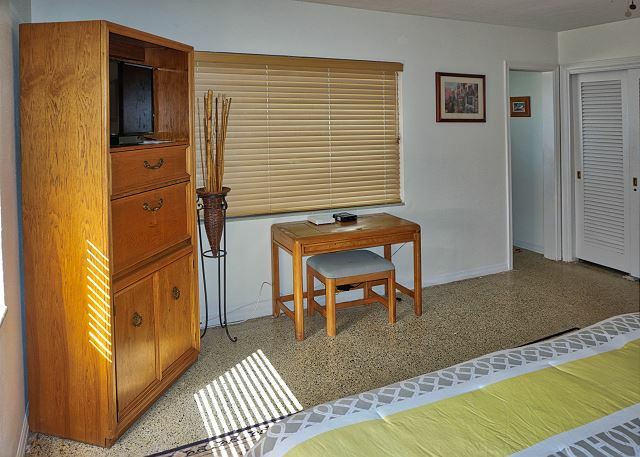 - If you are going to stay at this property please be prepared to work with a rental company, you are not getting the personal attention that you normally would when dealing with an owner. The property was perfect for a local weekend getaway. The accommodations were spacious and clean. The location on the intercoastal was perfect for paddleboarding and it was an easy walk over to the beach for morning walks and sunsets. The management and staff were all very friendly. Overall, I highly recommend this property.